Titania- and silica-polymer hybrid materials were prepared with an in situ sol-gel process for refractive index-matched, optical thin-film applications. A random copolymer of methyl methacrylate (MMA) and 3-(trimethoxysilyl) propyl methacrylate (MSMA) (poly(MMA-co-MSMA), MMA:MSMA = 78:22 molar ratio) capped with trialkoxysilane in MSMA units was used as a precursor. The precursor was further reacted with titanium (IV) isopropoxide (TTIP) and tetraethyl orthosilicate (TEOS) to synthesize the high (H) and low (L) refractive index hybrid materials, respectively, with an acid-free sol-gel method, which prevents the corrosion of neighboring metals or metal oxides used in optical thin-film applications. The refractive indices of the H and L materials were controlled by the concentrations of TTIP and NaCl used during the acid-free sol-gel process, respectively. The H material on a glass substrate exhibited a high optical transparency of 96%, with respect to bare glass at 550 nm, and a high refractive index of 1.82 when the precursor was reacted with TTIP (90 wt% of the precursor). The L material on a glass substrate showed a high optical transparency of ~100%, with respect to bare glass at 550 nm, and a low refractive index of 1.44 when the precursor was reacted with 2.5 M of NaCl. An indium tin oxide (ITO)/L/H/poly(ethylene terephthalate) thin-film substrate, with the optimum thicknesses of each layer calculated with Macleod software, had a reflexibility difference (ΔR) of < 1% over 65% of the visible spectrum, as well as good flexibility and a long lifetime. These results indicate that the spin-coatable L and H materials could replace the typical low and high refractive index inorganic materials (SiO2 and Nb2O5, respectively) used for flexible touch screen applications. Z. Knittl, Optics of Thin Film (John Wiley, 1981). H. A. Macleod, Thin-film Optical Filters (Institute of Physics Publishing, 2003). J. Q. Xi, M. F. Schubert, J. K. Kim, E. F. Schubert, M. Chen, S. Y. Lin, W. Liu, and J. A. 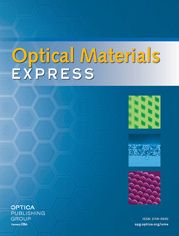 Smart, “Optical thin-film materials with low refractive index for broadband elimination of Fresnel reflection,” Nat. Photonics 1, 176–179 (2007). J. Sancho-Parramon and V. Janicke, “Effective medium theories for composite optical materials in spectral ranges of weak absorption: the case of Nb2O5-SiO2 mixtures,” J. Phys. D Appl. Phys. 41(21), 215304 (2008). H. Schmidt, G. Jonschker, S. Goedicke, and M. Mennig, “The Sol-Gel Process as a Basic Technology for Nanoparticle-Dispersed Inorganic-Organic Composites,” J. Sol-Gel Sci. Technol. 19(1), 39–51 (2000). L. H. Lee and W. C. Chen, “High-Refractive-Index Thin Films Prepared from Trialkoxysilane-Capped Poly(methyl methacrylate)-Titania Materials,” Chem. Mater. 13(3), 1137–1142 (2001). P. J. Flory, Principle of Polymer Chemistry (Cornell University Press, 1953). G. Schottner, “Hybrid Sol-Gel Derived Polymer: Applications of Multifunctional Materials,” Chem. Mater. 13(10), 3422–3435 (2001). C. B. Breslin, A. M. Fenelon, and K. G. Conroy, “Surface engineering: corrosion protection using conducting polymers,” Mater. Des. 26(3), 233–237 (2005). J. Brinker and G. W. Scherer, Sol-Gel Science (Academic Press, 1990). J. Livage and C. Sanchez, “Sol-gel chemistry,” proceedings of the Third International Symposium on Aerogels, J. Non-Cryst. Solids 145, 11–19 (1992). S. Y. Chen and S. Cheng, “Acid-Free Synthesis of Mesoporous Silica Using Triblock Copolymer as Template with the Aid of Salt and Alcohol,” Chem. Mater. 19(12), 3041–3051 (2007). L. M. Smith and M. L. Coote, “Effect of temperature and solvent on polymer tacticity in the free-radical polymerization of styrene and methyl methacrylate,” J. Polym. Sci. Pol. Chem. 51(16), 3351–3358 (2013). C. Zhang, L. Li, H. Cong, and S. Zheng, “Poly(methyl methacrylate)-block-poly(N-vinyl pyrrolidone) diblock copolymer: A facile synthesis via sequential radical polymerization mediated by isopropylxanthic disulfide and its nanostructuring polybenzoxazine thermosets,” J. Polym. Sci. Pol. Chem. 52(7), 952–962 (2014). J. Du and Y. Chen, “Atom-Transfer Radical Polymerization of a Reactive Monomer: 3-(Trimethoxysilyl)propyl Methacrylate,” Macromolecules 37(17), 6322–6328 (2004). H. Wei, C. Cheng, C. Chang, W. Q. Chen, S. X. Cheng, X. Z. Zhang, and R. X. Zhuo, “Synthesis and Applications of Shell Cross-Linked Thermoresponsive Hybrid Micelles Based on Poly(N-isopropylacrylamide-co-3-(trimethoxysilyl)propyl methacrylate)-b-poly(methyl methacrylate),” Langmuir 24(9), 4564–4570 (2008). W. Tao, F. Fei, and W. Y. Chuan, “Structure and thermal properties of titanium dioxide-polyacrylate nanocomposites,” Polym. Bull. 56(4), 413–426 (2006). Z. H. Huang and K. Y. Qiu, “Preparation and thermal property of poly(methyl methacrylate)/silicate hybrid materials by the in-situ sol-gel process,” Polym. Bull. 35(5), 607–613 (1995). R. Al-Oweini and H. El-Rassy, “Synthesis and characterization by FTIR spectroscopy of silica aerogels prepared using several Si(OR)4 and R”Si(OR’)3 precursors,” J. Mol. Struct. 919(1-3), 140–145 (2009). J. Ren, Z. Li, S. Liu, Y. Xing, and K. Xie, “Silica-Titania mixed Oxides: Si-O-Ti Connectivity, Coordination of Titanium, and Surface Acidic Properties,” Catal. Lett. 124(3), 185–194 (2008). C. Chang and W. Chen, “Synthesis and Optical Properties of Polyimide-Silica Hybrid Thin Films,” Chem. Mater. 14(10), 4242–4248 (2002). Y. Yu, C. Chen, and W. Chen, “Synthesis and characterization of organic-inorganic hybrid thin films from poly(acrylic) and monodispersed colloidal silica,” Polymer (Guildf.) 44(3), 593–601 (2003). H. B. Sunkara, J. M. Jethmelani, and W. T. Ford, “Composite of Colloidal Crystals of Silica in Poly(methyl methacrylate),” Chem. Mater. 6(4), 362–364 (1994). Y. Liu, C. Hsu, and K. Hsu, “Poly(methyl methacrylate)-silica nanocomposites films from surface-functionalized silica nanoparticles,” Polymer (Guildf.) 46(6), 1851–1856 (2005). Y. Hu, C. Chen, and C. Wang, “Viscoelastic properties and thermal degradation kinetics of silica/PMMA nanocomposites,” Polym. Degrad. Stabil. 84(3), 545–553 (2004). E. Rubio, J. Almaral, R. Ramirez-Bon, V. Castano, and V. Rodriguez, “Organic-inorganic hybrid coating (poly(methyl methacrylate)/monodisperse silica),” Opt. Mater. 27(7), 1266–1269 (2005). C. S. Oh, S. M. Lee, E. H. Kim, E. W. Lee, and L. S. Park, “Electro-Optical Properties of Index Matched ITO-PET Film for Touch Panel Application,” Mol. Cryst. Liquid Cryst. 568(1), 32–37 (2012). W. Choi, “Touch Panel with Improved Pattern Visibility,” Korea Patent WO 2014027781 A1, February 20, 2014. S. H. Yue, Y. B. Jung, I. S. Kim, M. H. Lee, and J. Cho, “Capacitive Touch Panel with Improved Visibility,” Korea Patent WO 2013005979 A2, January 10, 2013. S. J. Park, 2012, “Improvement of Light Extraction Efficiency of OLED Utilizing High Refractive Index Organic Material and Optical Simulation”, a master’s thesis, Kyungpook National University Graduate School, Daegu. A. Vincent, S. Babu, E. Brinley, A. Karakoti, S. Deshpande, and S. Seal, “Role of Catalyst on Refractive Index Tunability of Porous Silica Antireflective Coatings by Sol-Gel Technique,” J. Phys. Chem. C 111(23), 8291–8298 (2007). S. J. Lee, E. J. Lee, I. Kang, S. Park, K. Yoon, G. Kwak, and L. S. Park, “Fabrication and Performance of Flexible OLEDs AGZO/Ag/AGZO Multilayer Anode on Polyethersulfone Film,” Mol. Cryst. Liquid Cryst. 550(1), 172–182 (2011). D. Lee, H. Lee, Y. Ahn, Y. Jeong, D. Y. Lee, and Y. Lee, “Highly stable and flexible silver nanowire-graphene hybrid transparent conducting electrodes for emerging optoelectronic devices,” Nanoscale 5(17), 7750–7755 (2013). E. Kim, C. Yang, and J. Park, “The crystallinity and mechanical properties of indium tin oxide coatings on polymer substrates,” J. Appl. Phys. 109(4), 043511 (2011). J. L. Elechiguerra, L. Larios-Lopez, C. Liu, D. Garcia-Gutierrez, A. Camacho-Bragado, and M. J. Yacaman, “Corrosion at the Nanoscale: The Case of Silver Nanowires and Nanoparticles,” Chem. Mater. 17(24), 6042–6052 (2005). Fig. 1 Synthesis of H and L.
Fig. 2 NMR spectrum of P.
Fig. 3 FT-IR spectra of P, H, and L. The inset shows the enlarge spectrum of P.
Figures 4 FE-SEM images of the top-down views of (a) P, (b) H, and (c) L thin-films. Fig. 5 TGA thermograms of P, H, and L.
Figures 6 Transmittances and refractive indices of (a) H and (b) L thin-films as functions of the wt% of TTIP and NaCl concentration, respectively. Figures 7 (a) ΔR of the ITO/SiO2/Nb2O5/PET (solid line) and ITO/L/H/PET (dotted line) substrates plotted as a function of wavelength. Photographs of the ITO patterns on (b) ITO/PET and (c) ITO/L/H/PET substrates. Figures 8 (a) Plot of the percentage resistance increase of the ITO/SiO2/Nb2O5/PET and ITO/L/H/PET substrates as a function of the number of bending cycles [32–35]. (b) Photograph of the ITO/L/H/PET substrate during the bending test at minimum width of 40 mm. (c) Plot of the percentage resistance increase of the ITO/L/H/PET substrates prepared with and without acid as a function of the duration in a chamber maintained at 85 °C and 85% relative humidity [33–35].